For a project, I need to make a testbed (shield) for the ShieldBuddy. I need SPI to control a set of digital potentiometers. As I need to place the digipots on the shield, I had wanted to use the SPI channels 1 or 2 (p12,11,13 or p50,51,52 - MOSI) instead of the P201. I checked the manual, and I couldn't make it seem to work. (SPI.begin(BOARD_SPI_SS0_S1) etc.). I was wondering if there is an example code how to use channels 1 or 2. *I also tried looking in the Variant.h (C:\Program Files (x86)\Arduino\hardware\aurduino_Dx\aurix\variants\tc275) to find any clues if there are other pins that I need to declare to change the MOSI, MISO and SCK pins. **I also tried setting the SPI pins, but Shieldbuddy's SPI library doesn't support the SPI.setMISO etc. to assign the SPI pins unlike the teensy. ***The Shieldbuddy's Spi ICSP P201 doesn't seem to be physically connected to the other pins (11,12,13,50,51, or 52) like the mega or uno. Please make sure that you state which pin is to be used as the chipselect when you use Spi.transfer e.g. 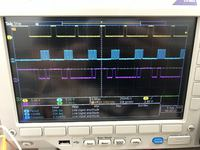 Spi.transfer(BOARD_SPI_SS0_S1, data). Is the Spi.transfer16 functions implemented to send 16bits instead of 8bits? The spi driver is 8-bit like the normal Arduino. It enabled the SPI Channel 1, but I can't seem to make the digital potentiometer work in channel 1. I have the digipot wired to both P201 and channel 1 and just changed the channel. I am not sure what the real problem is. If it is the MOSI or the CS or something else that is different between the channels. My suspicion is that whenever I call the SPI.transfer(BOARD_SPI_SS0_S1, cmd) then SPI.transfer(BOARD_SPI_SS0_S1, data), it toggles the CS in between. Is there a way for it to not toggle the CS, or would I need to use the 16-bit (SPI.transfer16). If so, where can I get references on how to use that. 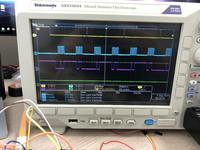 I have attached pics of the oscilloscope (yellow-CS, blue-SCK, violet-MOSI,green-digipot). The first image is using P201, while the second one is channel 1. Thank you. I figured it out. I just used a different CS pin (manual toggle) for the actual control. Quick question, how do I change SPI mode? I have a problem similar to that of angsanto08. My shield has two SPI devices. Both devices are using the SPI Channel 1 at pins 11, 12 and 13. One device is connected to CS pin 10 and one is connected to CS pin 4. Now I am looking for a possibility to communicate with the CS pin 4 device without addressing the CS pin 10 device at the same time. Is there a way to prevent the automatic switching of CS pin 10 while using a different manually switched CS pin?